With startups uprising nowadays, people tend to ditch on writing a business plan and immediately build their product whenever starting their own startup. Sure, business plans could be your blueprints of tomorrow but things change real quick that you always have to stick to plan B. Research, analysis, and setting milestones are important parts of your plan but how certain does your research prove that these plans follow along the way? The thing is its easy to pivot and the market place is moving indefinitely given the trending movement of the startup scene. Considering a business plan requires a 5-year forecast, its hard to tap into that underlying surface. With one small pivot, you could succeedingly scrap out the hair-plucking nights of typing out your masterpiece. Flexibility is important to keep your head in the game and regardless of what situation, you should always learn to adapt in order to have a sustainable business. Neither Mark Zuckerburg, Bill Gates nor Steve Jobs created a thorough business plan yet they managed revolutionize the world. What makes them so special that they busted out the “You need a business plan for your business to succeed” mantra advised by MBA’s/traditional business owners? Simple. They execute, they analyze and they learn. Pretty much the same cycle to create the “perfect” product needed by people. This leads us to the principle called the Lean Startup. So what is the Lean Startup? If you’ve been involved with the startup scene lately you’ll likely overhear this great principle. According to Eric Ries – the author of The Lean Startup -, (in non-verbatim) it’s a method for developing your business that adaptively responds to the needs of your market. This means that by building a product that addresses the needs of your customers, you reduce the risk of failure. There has been a coined term called MVP (Minimum Viable Product) which means a product built with the least minimum effort used to validate your customers feedback. Having your product out there with the slightest features is far more better than getting stuck with analysis paralysis. The first MVP’s can be as scrappy as a crumpled piece of paper or a dismantled phone. Corny as it seems but the important thing is learning from your customers. Starting an early MVP is a great way of fine-tuning your product. By iterating on each version of it, you are slowly meeting demands from your customer and get credible information you need to improve on your next iteration (this process is called validated learning). Just keep on iterating ’till you meet your customers demand. In the case of Zuckerburg, initially Facebook was only a social media website where you can message friends however through their iterations they pivoted on implementing the news feed, then the Facebook apps, and so on until their current motive on Augmented Reality. So how is this different from doing the traditional business plan? A LOT. Let me tell you that from the time spent on developing your product, the lean startup takes the cake simply because you can show your product the moment you built it (regardless of how scrappy it is). For business plans as soon as you’re done doing it, you then start to develop your product and make sure it follows the specs written. There’s a huge time spent from the write-up ’till nearly perfecting your product whereareas the lean startup approach already requires you to start from a scrappy product, immediately provides you the feedback you need from your customers, refine the product, then iterate. Without even starting to write on the first page of your business background, you already have a testable product already going through succeeding phases leaving the latter steps behind. Your research undergoes through the results of your MVP while business plans can even cause you some analysis paralysis making it a roadblock to move forward. Apart from time, the approach is also advantageous on innovating products, team practices, key metrics and also reduced risk. People now would get their hands dirty right away and just learn from the process. What would be a better way to do it than to just do it? As a software developer, I can pretty much relate this to some software engineering principles. 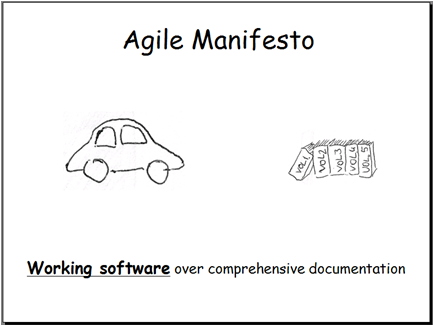 We have this thing called “Agile Manifesto” and one of its famous mantra is “Working software over comprehensive documentation“. You pretty much get the picture from that one and it clearly states that having a workable software is better than a pile-load paper. The mantra is very much related to the lean startup approach. The product speaks louder than words they say. Modern business has now evolved and you too should now adapt to this new principle if you plan to start your own startup. Say goodbye to business plans and say hello to the lean startup! Learn more about the lean startup on their website and grab a copy of the book!